About $1 million in state and federal funds were awarded to 13 public schools for creative projects to boost student learning and involvement. Truancy, workplace training for adult special education students and urban irrigation models are just some of the topics students at 13 schools statewide plan to tackle through new “innovation grants” distributed by the Hawaii Department of Education. The first-ever innovation grants — amounting to just over $1 million total — are intended to encourage students to help develop creative ways to address complex issues facing their schools and community, as well as result in academic gains. The innovation grants are supported by $650,000 in federal Title I funding and $350,000 in state general funds. Eight schools received grants ranging from $10,000 to $250,000 earlier this year. Another batch of “micro-grants” in amounts of $500 up to $5,000 apiece were awarded to five schools using a separate $20,000 DOE allocation. Several of the winners were Title I schools, which receive federal support because a high percentage of their students come from low-income households. The grant initiative was unveiled late last year as a way of trying to advance Hawaii’s strategic plan of reducing the achievement gap, boosting high school graduation rates and preparing more kids for college. The winning proposals reflect a broad range of ideas that incorporates STEM (science, technology, engineering and math) learning, arts education, and student-led workspaces, One school was awarded a grant to hold an annual career fair that could develop more engaged kids. “The school design innovation grantees have developed initiatives that build on existing successes through a focus on three high impact strategies that have been shown to have a strong positive effect on student achievement and attainment: school design, student voice and teacher collaboration,” DOE spokeswoman Lindsay Chambers said in an emailed statement. Not all the winning proposals shared by the DOE with Civil Beat expressly state how the projects might translate into academic improvement. A selection committee comprised of assistant superintendents, directors and DOE support staff chose the 13 schools out of roughly 70 applicants, according to the department. The 13 grant recipients represent all levels of the K-12 spectrum and include traditional DOE and public charter schools. The winners include schools on Oahu and the neighbor islands of Big Island, Maui, Kauai and Molokai. Maui High was awarded a $150,000 grant based on its proposal to lease and run an off-site workspace to provide job skills training for adult special education students aged 18 to 21. Special education services are provided to students in Hawaii up to age 22. Ten percent of Maui High’s student enrollment of 1,900 in 2016-17 had special needs, according to school statistics. 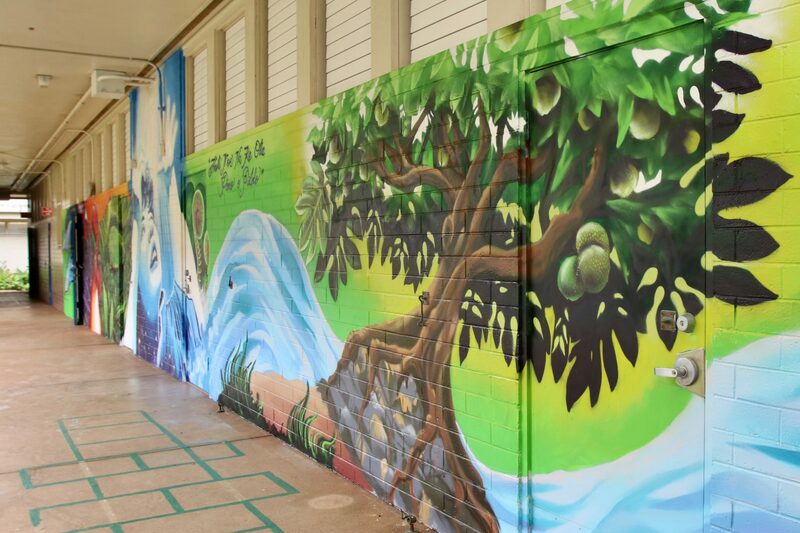 A 70-foot wide mural at Palolo Elementary funded through an innovation grant will assist in arts instruction. Honokaa High & Intermediate on Big Island proposed to establish an alternative learning center on nearby Department of Land and Natural Resources property. The center will work with students who are frequently truant and “are not interested in learning in the traditional classroom,” according to a description of the school’s proposal. Kualapuu Elementary New Century Public Conversion Charter School, a rural Title I school on Molokai where 86 percent of kids receive free and reduced lunch, will use its $70,000 grant to hire a consultant for training and professional development “to create a school climate that is trauma-sensitive,” according to vice-principal Loretta Sherwood-Labrador. The school’s trauma-sensitive needs stem from poverty, food insecurity and having students with parents who are incarcerated. “I’m really excited for this (grant) to happen to our students, because our teachers want to be responsive to the needs of the community,” Sherwood-Labrador said. Other schools are emphasizing STEM education. Hawaii Technology Academy, a public charter school, received a micro-grant to teach how to code miniature driverless robotic cars. 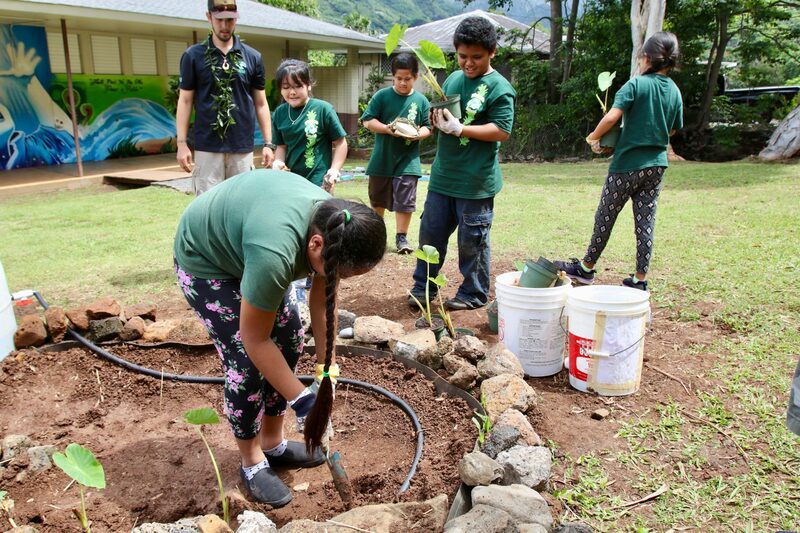 Kalani High received a micro-grant to teach kids Python programming language “to produce irrigation and plant monitoring control units,” according to that school’s plan. Schools must implement their projects by September 2019, although some — like Palolo Elementary — have already begun using the funds. Palolo Elementary used part of its $90,000 grant to establish a “Center for Creative HeARTS” that includes a 70-foot-wide outdoor mural. The center will be used for visual and performing arts learning and to help incorporate social emotional learning concepts into the classroom, according to the DOE. The grant was also used to plant a “learning garden” to be used for lessons on environmental sustainability.